Functional rhinoplasty can address physical abnormalities in the nose that can impact breathing, such as those caused by congenital defects. In addition, functional nose surgery can treat the effects of physical trauma as well. The nose surgeon will reshape and reposition the nasal bones and cartilage to help the patient attain the nasal contours that will enable them to breathe properly and feel more self-confident. Board certified facial plastic and reconstructive surgeon Dr. Eric Yavrouian provides rhinoplasty cosmetic surgery to patients in Glendale, Pasadena, Burbank, Greater Los Angeles, Beverly Hills, CA, and surrounding locations. A deviated septum develops or moves to one side of the nasal cavity instead of bifurcating it into two equal airways. The septum can bend to one side creating an S-shape or bow out into a C-shape. Regardless of the type of deviation, a deviated septum can obstruct airflow gradually damaging the delicate tissues of the nose. The surgeon may reshape the bony upper portion of the septum or the cartilaginous lower portion depending on where the septum has deviated. Some patients experience a condition known as caudal septal deviation where the septum moves off the anterior nasal spine. The surgeon can address this shift in the septum by realigning its base on the anterior nasal spine. Rhinoplasty is also an effective treatment for enlarged turbinates. Turbinates are long, narrow bones that project outwards from either side of the nasal cavity which ends in tiny, curled, knob-like shapes. Superior Turbinates: These are located high within the nose between the eyes. Inferior Turbinates: These turbinates end just above the nostril line. Turbinates humidify air when a person inhales as soft tissue covers the turbinates. Turbinate rhinoplasty can effectively treat turbinates that may have become inflamed due to allergies and other irritants. Sometimes one turbinate may contract as the septum pushes it to one side. Consequently, the turbinate in the opposite nasal airway grows larger to compensate for the constricted turbinate. This further impedes the breathing process. Similar to enlarged turbinates, nasal polyps are usually associated with irritation and allergies. Nasal polyps are harmless growths that develop within the nasal airways and appear as soft, jelly-like bulbs. The surgeon will use a snare instrument to reach within the nose and cautiously excise the polyps. Nasal polyps, unfortunately, have a tendency to grow back. Therefore, patients with this condition should take allergy meds as well. Various types of nasal fractures may warrant different types of osteotomy (the practice of rejoining and resetting bones). If left untreated, these fractures can obstruct breathing and lead to a misshapen or crooked nose. Fractures can develop anywhere along the nasal “bony pyramid” which is the pyramid-like bony structure of the nose projecting outward from the face. Greenstick fractures may develop along the sides of the nasal bones. They commonly occur in children as their bones are still developing and are much more pliable than adult bones. Consequently, greenstick fractures are usually incomplete breaks instead of completely broken bones. The saddle deformity is a more severe type of fracture. The nasal bridge and septum break down in this condition and become depressed toward the face leading to the development of a saddle-like shape that is noticeable when viewing the face in profile. 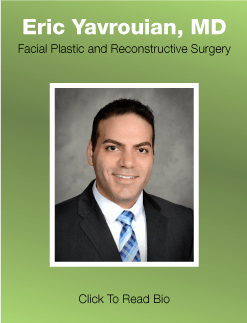 Facial plastic and reconstructive surgeon Dr. Eric Yavrouian receives patients from Glendale, Pasadena, Burbank, Greater Los Angeles, Beverly Hills, CA, and nearby areas for rhinoplasty cosmetic surgery.